Planning your next trip to the capital? Opt for an aparthotel for the best of both worlds - the comfort and ease of a hotel, combined with the flexibility and freedom of an apartment. 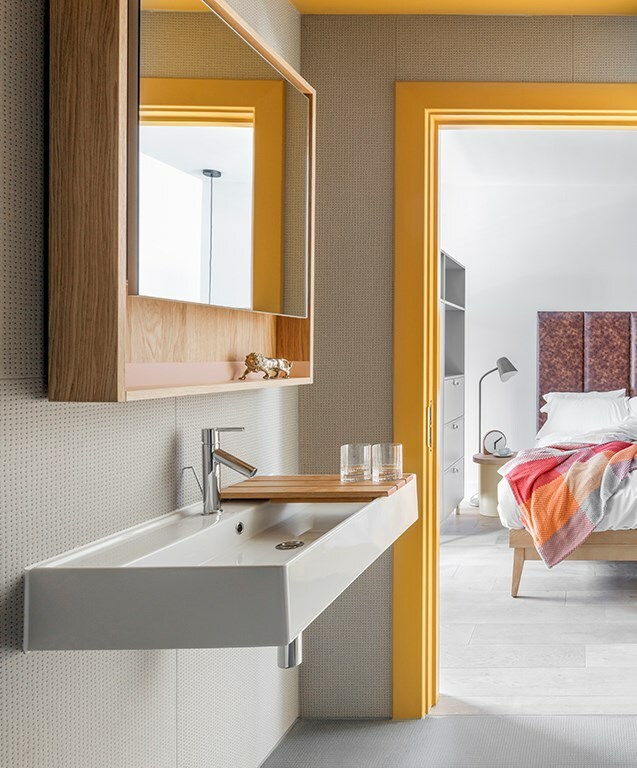 We’ve selected a few of our favourite aparthotels in Edinburgh for a stylish stay, whether you’re visiting for work or play. If you’re looking for the most Instagrammable interiors in Edinburgh, Eden Locke is the place to go. Offering a range of design-led suites, this super trendy aparthotel is perfect for both short and long stays. Each suite is intelligently designed to maximise space without compromising on style. In your room, you’ll find super fast wifi, a smart TV, a fully equipped kitchen, plenty of storage space, and the signature Locke L-shaped sofa. There are also Kinsey Apothecary toiletries in the bathroom, and T2 Teas and Doisy & Dam Chocolates in the kitchen. As beautiful as the suites are, you’ll probably want to escape your room at some point during your stay. Before heading out to explore the city, make sure you stop by the gorgeous cafe downstairs for a morning coffee. In the evening, it transforms into the Purist Bar, serving up nightcaps in relaxed surroundings. For a properly luxurious stay, book yourself into the new Edinburgh Grand for a five star experience. Housed inside an impressive former bank, this aparthotel is about as glam as you can get. The apartments range from compact studios for one guest, all the way up to family-friendly apartments for six. If you’re really pushing the boat out, opt for the Penthouse for three stylish bedrooms, an on-trend living and dining area, and your very own private roof terrace with one of the best views in Edinburgh. As the name alludes to, everything about this place is grand. From the polished marble floors and sweeping staircases in the lobby to the velvet sofas and ornate wood paneling in the rooms. They’ve thought of all the essentials too, including Malin + Goetz toiletries, GHD straighteners, Nespresso coffee machines and Bose sound systems. Nestled in the heart of Edinburgh’s New Town, The Chester Residence is an elegant aparthotel that feels like a home away from home - with an extra dose of luxury. The apartments are split between two Georgian townhouses, so you can expect high ceilings, big windows and very stylish surroundings. There are a range of one and two bedroom apartments to choose from, each decked out with plush modern furniture, a big, comfortable bed and all the extras you could possibly need for a trip to the capital. The Chester Residence can even organise a private chef for you, to whip up a delicious meal from the comfort of your own apartment. You can also have room service breakfast delivered to your door, and they can even provide a laundry service - perfect for longer stays.